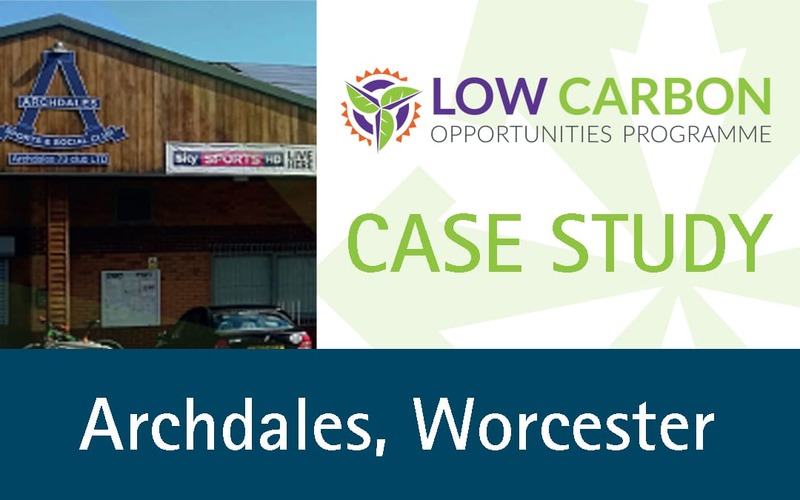 Archdales 1973 Club, a social club in Worcester, approached the Low Carbon Opportunities Programme looking for support to install renewable energy at their premises. Through the programme, they were given free consultancy advice by impartial renewable energy experts, Carbon Smart. Helen from Carbon Smart identified that Archdales could install a solar photovoltaic (PV) array on their roof space, and that this would save them around £4,500 every year on their energy bills. Archdales’ committee agreed this was a great opportunity and applied to the programme for 45% grant funding towards the costs of installing the solar panels. Following the successful grant application, Archdales advertised the opportunity on the procurement portal FinditinWorcestershire and were delighted to accept the quote from local installers, 2020Solar. 2020Solar included a free public energy display system in the installation, meaning that all visitors to Archdales can see exactly how much energy the solar panels are generating and how much carbon is being saved. This display is a great conversation piece and has really helped to promote solar PV systems to the local people and businesses who use Archdales. Following the completion of the installation, it was a pleasure for the Low Carbon Opportunities Programme team to go and inspect the installation and sign off the grant claim. Archdales were able to claim 45% of the project cost – in total just under £15,000. This contribution means that the club will pay off their contribution in less than 4 years.